For the people of Thoothukudi, the story of Sterlite Copper seems to build like the story of the Bhopal gas tragedy, which left thousands dead, lakhs injured, the land devastated and the company responsible off the hook. As the world watched the ‘March for Our Lives’ demonstrations against gun violence in Washington DC on March 24, there was a similar outpouring of emotion on the streets of Thoothukudi, a port city in south Tamil Nadu. The residents of the district had gathered in large numbers to demand the permanent closure of the copper smelter owned and operated by Vedanta Ltd. The environmental activist Nityanand Jayaraman, who has been documenting the issue for several years, has written extensively (such as here and here) about the role played by state regulatory authorities like TNPCB, the Ministry of Environment, Forests and Climate Change (MoEFCC) and the local district administration in facilitating Sterlite. 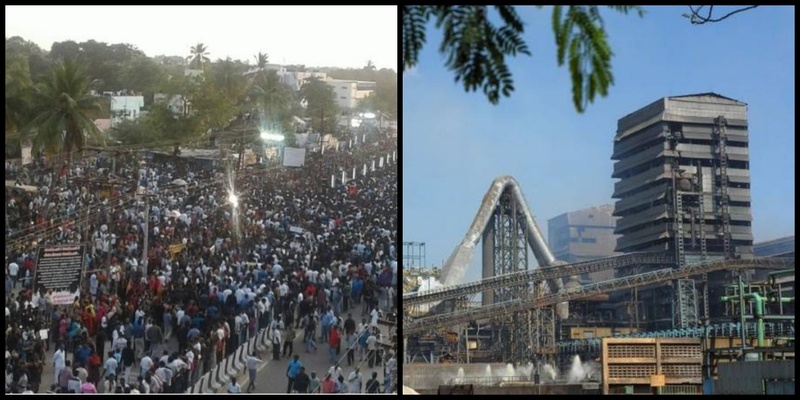 The most recent protests, which crossed the 48-day mark on April 1, were triggered by Vedanta’s move to build another copper smelter in Therkuveerapandiyapuram village to double the company’s total production in Thoothukudi from 400,000 tonnes to 800,000 tonnes a year and making it the second biggest in the world. The protests are spearheaded by the residents of Kumarettiyapuram village, which is within 200 m of the proposed plant. Sterlite Copper had been trying to expand its production for over a decade in the face of widespread public opposition and legal and environmental hurdles. If the second plant comes up, life will likely become worse for the villagers as well as the beleaguered city of Thoothukudi. In 2009, Sterlite Industries obtained an environmental clearance from the MoEFCC to set up a 1,200-tonne per day copper smelting complex in Thoothukudi without any public consultation. The MoEFCC maintained that the project’s location within the SIPCOT complex (est. 1985) exempted it from conducting a public hearing, otherwise required for copper smelters by the Environmental Impact Assessment Notification, 2006. However, records show that the proposed Sterlite project is located in the second phase scheme of SIPCOT, named Tuticorin Industrial Park, which was given administrative sanction to acquire land in 1996, and not in the existing SIPCOT complex. Additionally, in 2014, SIPCOT had failed to disclose that it had already allocated 324 acres for Strelite’s new project in its application to the MoEFCC. A 2018 report published by Nityanand Jayaraman’s solidarity group accused the MoEFCC, SIPCOT, the TNPCB and Sterlite of having misled the court about the new smelter’s location. The document further alleged that SIPCOT had deliberately withheld the fact that Sterlite had been allotted land in its phase II scheme while applying for environmental clearance. Worse, the report also found that the proposed complex was located on land designated ‘dry agricultural land’ in the village area masterplan, as approved according to the Town and Country Planning Act, 1971. Finally: Therkuveerapandiyam, a part of whose land has been allotted to Sterlite, is not classified as a ‘Special Industrial and Hazardous Use Zone’, so according to zoning regulations, a copper smelting plant can’t be set up there. However, bolstered by the Supreme Court’s 2014 judgement, the Madras high court’s dismissal of the petition against Sterlite and with the TNPCB consenting to establish in 2016, Vedanta Ltd. started working on building its new smelter. The TNPCB, SIPCOT and Sterlite have not responded to requests for comment. The company has also been trying to secure a political leg-up. In 2014, in response to a public interest litigation filed by the Association of Democratic Reforms (ADR), the Delhi high court found that the Bharatiya Janata Party (BJP) and the Indian National Congress had violated the Foreign Contributions (Regulations) Act, 1976, by received donations from foreign companies. Vedanta among them paid the parties a total of Rs 9 crore between FYs 2004 and 2010. It is the Board’s policy that neither Vedanta nor any of its subsidiary companies may, under any circumstances, make donations or contributions to political organisations within the United Kingdom or European Union… However in accordance with the normal accepted practice in India of making political donations in respect of elections, the Group made political donations of US$3.7 million (2013: US$0.97 million) either through a trust or directly in respect of the Indian general election. The Board believes that supporting the political process in India will encourage and strengthen the democratic process. The Wire had reported in 2016 as to how the government had slipped in an amendment to the Finance Bill to redefine “foreign” to include companies like Vedanta to avoid legal trouble for political parties in the future. Similarly, earlier this year, the Modi government introduced a clause in the original 2016 amendment to retroactively absolve the Congress and the BJP for accepting foreign donations. As the Thoothukudi protests are making clear, this link between Vedanta and political parties has very real victims paying the price with their health and lives. For the people, the story of Sterlite Copper seems to build like the story of the Bhopal gas tragedy, which left thousands dead, lakhs injured, the land devastated and the company responsible off the hook. On April 2, 2013, the Supreme Court struck down the Madras high court’s order to close the plant. Once the NGT also ruled in Sterlite’s favour on May 31 the same year, the factory was reopened. While the court had conceded that “the plant of the appellant did pollute the environment” by emitting noxious pollutants and discharging dangerous effluents, it justified its verdict by deferring to the revenue the plant generated for the Centre and the state, to the jobs it provided, to the cargo volume it contributed at Thoothukudi port and to India’s copper production. …the quantum of compensation must be co-related to the magnitude and capacity of the enterprise because such compensation must have a deterrent effect and the larger and more prosperous the enterprise, the greater must be the amount of compensation payable by it. … while noting that Sterlite Industries’ profit before depreciation, interest and taxes (PBDIT) for the financial year 2010-11 was Rs 1,043 crore. It may seem reasonable to levy a compensation of 10% of Rs 1,043 crore – but that’s actually a pittance. The chart (above) shows that the PBDIT of Vedanta, Ltd. from copper smelted in India and Australia between 2000 and 2017 totalled $3.62 billion. However, it paid only $18.4 million ($1 = Rs 54.34 on the day of the judgment) for having polluted Thoothukudi for 21 years. The latest series of protests in Thoothukudi is only the most recent show of anger; similar scenes have been playing out for over 20 years, against Sterlite as well as the state apparatus. In all this time, no major politician in Tamil Nadu had engaged with or openly supported the people on this issue, except Vaiko, leader of the Marumalarchi Dravida Munnetra Kazhagam. In FY 2016-17 alone, the profit-before-tax of Vedanta Ltd.’s operations in India was Rs 13,946 crore, according to the Vedanta Tax Transparency Report 2016-17. With this number in mind, the government should order Vedanta Ltd. to cease operations in Thoothukudi, make the company clean up the ecological damage it has wrought, and ensure that victims receive fair compensation. Only that will be a real deterrent. Lois Sofia is studying mathematics in Canada and tweets at @Red_Pastures.